With over seven generations to its name, the used Volkswagen Jetta is a vehicle that has withstood the test of time. First manufactured and sold in 1980, and with over 14 million vehicles purchased and produced since 2014, this is Volkswagen’s top-selling vehicle that has continuously improved with every generation. The used Volkswagen Jetta is known for superior space and comfort for a compact, family-sized vehicle. Having increased in size and power with every generation, this Volkswagen model is an efficient and affordable sedan with the power and price tag that beats out many comparable models in the vehicle market. Listed as one of the best selling European cars in the US, this is a car that deserves more than just a second glance. We’ll take a look at the 6th generation of used Volkswagen Jettas for sale (2011-2018) and reveal why it has been such a consistently popular model throughout the many, many years it has been manufactured. The Volkswagen Jetta was completely redesigned in 2011 to offer a car that was more spacious and with more cargo room for consumers. And the manufacturer’s at Volkswagen thoroughly accomplished their goal. The used 2011 Volkswagen Jetta comes with best-in-class trunk space, and can comfortably seat up to five adults with plenty of extra legroom. Some reviewers even stated the 2011 Volkswagen Jetta had the space of some mid-sized vehicles currently on the market. Getting 30 mpg in the city and 42 mpg on the highway, this spacious sedan also has the fuel economy to meet any budget requirements. The 2011 Volkswagen Jetta is also available with four engine options. The S model has a 2.0L 4-cylinder engine, while the SE and SEL trims are available with a more powerful 2.5L 5-cylinder engine. The Jetta GLI trim is the best performer with a turbo-charged 2.0 4-cylinder engine and also includes the best fuel economy at 42 mpg. Whatever the trim, you are coming away with a great vehicle when you purchase a used Volkswagen Jetta for sale. In 2012, the GLI trim on the Volkswagen Jetta was introduced. The upgrades on this trim included a 2.0L TSI 200 horsepower engine as well as a fully independent suspension. The manufacturer’s also included many interior and exterior enhancements, including a black honeycomb grille, red painted calipers, as well as interior red-stitching. For those who enjoy driving with a manual transmission, the Jetta GLI and Jetta TDI are the only two trims to offer one as an option. The 2013 Volkswagen Jetta includes many superior capabilities, including a power reclining front seats, a 5-inch touchscreen with navigation, HD radio, available leather upholstery, leather-wrapped steering wheel, and push-button start, to name just a few of the high-tech extras that come available with this used Volkswagen Jetta model. The 2014 Volkswagen Jetta was manufactured with a number of changes from previous years – including a new turbocharged engine in the SE and SEL models, new standard independent rear suspension, and available Car-Net phone integration. The SE and SEL trim in this used 2014 Volkswagen Jetta include a new engine option: the turbo 1.8L 4-cylinder engine. Getting 36 mpg on the highway and delivering 210 horsepower, this Volkswagen Jetta is a step up when it comes to power and performance. In addition, the independent rear suspension improves the overall driving and stability performance of the vehicle, making the used 2014 Volkswagen Jetta a great option if you’re looking for dependability, fuel efficiency, and power in a spacious sedan. Additionally, the newly available Car-Net phone integration made smartphone integration possible within the 2014 Volkswagen Jetta model. In 2015, Volkswagen introduced a limited edition Jetta Sport trim. This trim added navigation with a rearview camera, sport suspension, 17-inch alloy wheels, two-tone sport seats, rear spoiler, and adaptive front-lighting system with interior ambient lighting. The spacious back seat was still a major selling point with this vehicle, as well as it’s stylish exterior. With the addition of the limited trim option, the 2015 Volkswagen Jetta is a great option if you’re looking for a unique and customized vehicle with superior performance and interior features. In 2017 the Volkswagen Jetta became available with a standard rearview camera for every trim option. In addition, the GDI trim was also equipped with a frontal collision system for superior safety and security. With an up-to-date media system, quiet interior, and the steering and handling to make any driver confident, this is a great used Volkswagen Jetta for sale at an unbeatable price. The manufacturer’s at Volkswagen wanted consumer confidence in the 2018 Volkswagen Jetta, which is why they issued a new, longer warranty on the vehicle – 6 years and 72,000 miles. 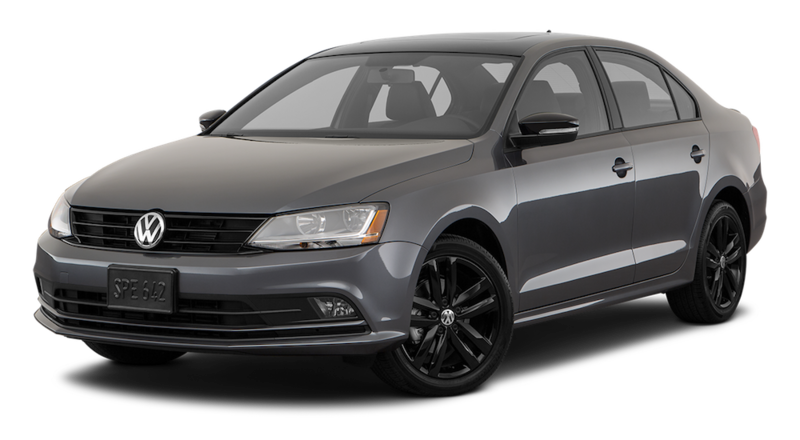 This is tremendous new insurance for your used Volkswagen Jetta and is excellent for those who are looking for reliability and dependability in their next car. The exterior design was also recrafted for this 2018 Volkswagen, with a sculpted hood and with sportier and sleeker edges. With winged headlights, and that sought after panoramic moonroof, this is a great vehicle to take out on the town. In addition, there are also many enhanced interior upgrades as well for this used Volkswagen Jetta. The interior includes an updated 8-inch touchscreen, including navigation and other apps, as well as a Car-Net security and safety service. Finally, the 2018 Volkswagen Jetta comes with a suite of safety technologies including adaptive cruise control, blind spot monitor, light assist, lane assist, park distance control – which alerts you as you back out of a parking space, forward collision warning, and rear traffic alert. With these top-of-the-line features as well as a sophisticated interior and exterior, this is a 21st Century vehicle that’s going to be hard to beat. We appreciate your interest in our inventory, and apologize we do not have model details displaying on the website at this time. Please fill the form out below and our team will quickly respond, or, please call us at (855) 846-8666 for more information. Visit McCluskey Auto for Your Used Jetta Today! When it comes to used car dealers, there is no better place to purchase than McCluskey Auto – offering some of the best prices in all of Cincinnati, Ohio, as well as possessing the best and most diverse inventory around, we’re confident you’ll find the perfect vehicle at our dealership. We pride ourselves on our low rates and high standards for our vehicles, and if you’ve got a particular brand and model in mind, we’re sure we’ll have it on our lot for you to check out. From our excellent financial department who can help you with your budget and any loan services you may need, as well as our friendly and helpful sales team who will truly get to know you and your needs before taking you out on the lot, to our highly trained and certified Service team, we have the departments, employees, and service capabilities to be a one-stop-shop for servicing, buying, and financing a vehicle. So what are you waiting for? Come visit our lot today to take our used cars out for a spin, we’re positive you’ll find a vehicle you just won’t be able to leave our lot without.